Uniform Rounded is a contemporary typeface created by Richard Miller and published by Miller Type Foundry which is based on Uniform. It contains a full range of weights and three widths. The widths geometric type was designed around the circle. An original idea which makes it a versatile font ideal for multitude of uses. Also supports over 140 languages and a lot of OpenType Features. Uniform Rounded cannot be missed! 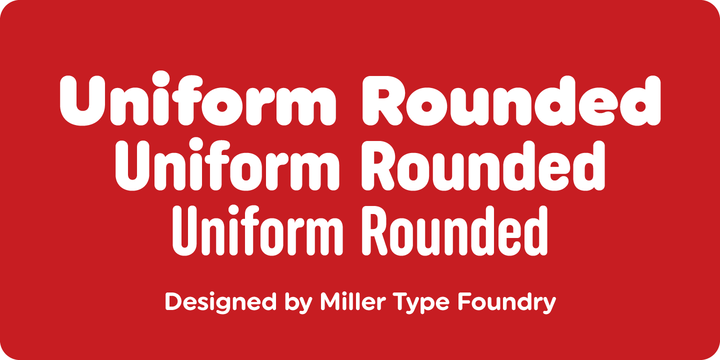 Note: Uniform Rounded is a trademark of Miller Type Foundry. Price: starting from $25,99 for one font to $249 for all 18 fonts. A font description published on Friday, November 6th, 2015 in Fonts, Miller Type Foundry, Richard Miller by Alexandra that has 7,890 views.